I'm pleased to announce that I've completed work on one of the top voted ideas from the suggestion box... Player Trading! 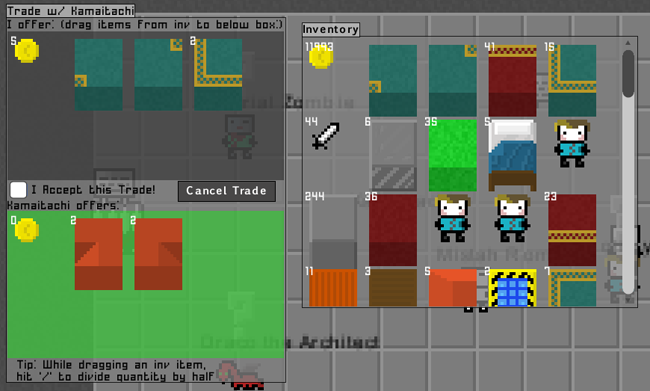 Drag the items from your inventory that you wish to offer to the dark gray box at the top half of the trade window. You can drag an item out of the trade window to no longer offer it. To change the quantity of an item offered, press / while dragging an item stack in or out of the window to increment or decrement the quantity by that much. When you are happy with the trade, click 'I accept this trade' - your box will turn green to indicate acceptance. When both of you click accept, the trade will be executed. PS - build 511 should also fix that weird issue that sometimes happened where sometimes the active item window quantity displayed got desynced with your actual inventory quantity! Also, quantity font is white now to help with readability. It’s live now, so check it out! How do you select specific quantities of money? that didn’t answer the question because when i press / while trading it split the amount in half. when i press / while trading it splits the amount in half.